Read these suggestions SEVERAL times BEFORE getting started. Oven or vara. 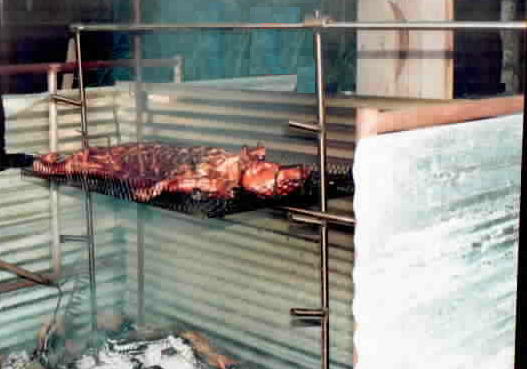 In Puerto Rico they used to cook the pigs - whole - outdoors on a stick. In the states, especially at Christmas we need a makeshift oven and shelter to keep the cold and snow out. 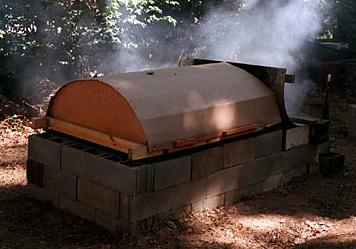 Use a large rotisserie grill if available, or make an inexpensive cinder block oven. You can split the pig in half and spread-eagle for faster cooking. Start cooking 8 hrs before meal time. pig - cleaned and ready to go. charcoal (20 lbs for a big pig), charcoal fluid, shovel, large rotisserie (optional) or makeshift oven. Mix all ingredients in a blender. Make it one day ahead and refrigerate. Order your pig - call around to find where to buy a pig in your area. Call butchers or visit meat markets outside the city limits until you find a source. The best pigs are under 120 pounds. If you're having a big party cook two pigs. A 90 pound pig can feed 40 people. Order the pig early because they tend to be sold-out when you need it. When you place your order instruct the butcher to leave the pig whole and clean by making a lengthwise slit from the hind legs to the front legs and leave the tail, ears, and feet. Have them clean it in and out - shave the hairs off. Pick it up the day you will season it that way you don't have to worry about storing it until you need it..
Seasoning - make your seasoning 2 days ahead and refrigerate. You can buy already peeled giant garlic cloves from restaurant food vendors. Put all seasoning ingredients through a food processor - this will be the easier part.. Preparing the pig - Use scalding hot water and a sharp razor blade shave off any hairs missed at the butcher shop. Cut lots of slits in the meat for the seasoning. Wash your pig well inside and out. Then wash using vinegar and dry. Season the pig well - use lots of seasoning in the slits inside and out. The pig must be seasoned 24 hrs ahead. Shave off any hairs missed by butcher. Secure the pig to the pole or stick using bale wire. 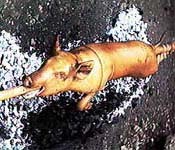 Pierce meat with wire and crisscross entire pig. Tie it well or it will slip around when you turn it. Some people tie it down just before cooking. Store the pig in ice the best you can (try a bathtub or tub with ice). Make sure that you leave it in a safe place where children and animals won't get to it. Make sure you have plenty of extra seasoning to continue seasoning while cooking. Getting Started. Use charcoal that does NOT have lighter fluid added because the meat will acquire the taste. Pile up about 10 lbs of charcoal, add lighter fluid and light. Let the coals burn about 20 minutes until they are hot and white. When the charcoal is ready use a shovel to spread the charcoal around forming a ring so that there is no charcoal directly under the pig. The grease from the pig will make flames that can scorch the meat. Cover the tail and ears with foil. Don't let the pig get brown early on because that means the fire is too high. It needs to cook slowly from the inside out. Every 30 minutes add just enough charcoal to keep the coals going. Again, the pig needs to cook slowly! Turn the pig every 15 minutes or so basting with seasoning as you go. 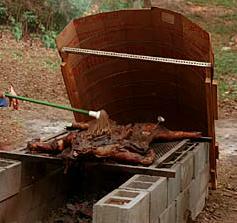 Cooking time varies but it is approximately six to eight hours depending on the size of the pig. Plan on starting early in the morning. Someone must be watching the pig to prevent disasters like it catching on fire or the coals turning off, etc etc. Cooking the pig is part of the fun and part of the festivities. Puerto Ricans like to arrive early to be there and lend moral support and just enjoy the ambiente. You should provide the cooks with music, coffee, or whatever will keep them warm and happy. Be ready for bad weather. In very cold weather the ideal thing is to use a large outdoor rotisserie grill (electric) or make an outdoor makeshift oven with cincer blocks or make an oven using a metal cabinet as with the photo on this page. Cover your pig with lots of foil to keep the heat in. If it rains or snows you will need a "lean-to" tent structure for both the pig and the cooks. Pig roaster. . . Build a roaster using inexpensive cement blocks (cinder blocks). You will need approximately 50 blocks. Lay them 4 blocks longs, two blocks wide, and 4 blocks high. Lay the end blocks inside the long walls. You should leave an opening on one of the short walls to add coals. You will have to cover your pig with foil on top to keep the heat in. If you want a faster cooking pig - cut it in half and cook it flat. You can build a grill using poles and chainlink fencing. 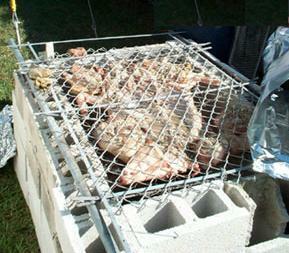 Make a two sided grill so that you can simply flip it over and make sure to tie down the pig using bale wire. (see photos above) The last segment of cooking put the skin side down to get it crunchy. First let the pig rest for 20 minutes before you begin to cut it up. This has to do with letting the juices sink into the meat for moist meat. Set the pig on a table. Steady the pig with a large fork and detach the hind legs, slicing from the front of the haunch toward the tail. Cut off the front legs by cutting into the shoulder where it joins the leg. Slice behind the shoulder blade to about 1 inch behind the ear. Then cut straight down to sever the leg. Place the pig (minus the legs) on its stomach. Make an incision the length of the spine, pressing the knife down to the bone. Press th back of the carving fork agains the loin and slice down, keeping the knife blade against the ribs to detach the loin in one piece. Carve each loin crosswise into pieces about 3 inches wide. Cut throught the knee joint to divide the leg into two, then carve the thigh into thin slices, holding the knife parallel to the bone. Carve the other side of the pig in the same fashion. Good luck! Send me pictures. If at first you don't succeed, try, try, again, and again!